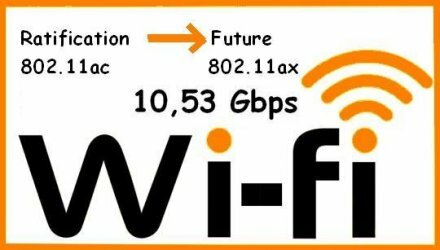 Is 802.11ax High Efficiency Specification, Future of WiFi ? The two chips, one for routers and the other for clients, are slated to deliver WiFi faster with dramatically better coverage. Your home Wi-Fi performance will soon get much better thanks to new Wi-Fi chips that Qualcomm announced today, the IPQ8074 system-on-chip (SoC) for broadcasters (routers and access points) and the QCA6290 SoC for receivers (Wi-Fi devices). They belong to the first end-to-end commercial Wi-Fi portfolio to support the all-new 802.11ax standard. In a nutshell, it's the next step in the evolution of Wi-Fi. Wi-Fi has evolved a great deal since the debut of 802.11b in 1999. After that we have 802.11g, 802.11n and the 802.11ac which is currently the most popular. Like 802.11ac, the new 802.11ax is backward compatible with previous Wi-Fi generations. However, it's the first standard that focuses not only on faster speed but also on Wi-Fi efficiency, or network capacity, especially in crowded air space. This means 802.11ax allows for faster real-world speed than previous standards. That said, on paper, 802.11ax can be four times faster than 802.11ac. Also, an 802.11ax router helps existing pre-802.11ax Wi-Fi devices have faster speed thanks to its ability to manage traffic diversity and overcome the density of overlapping networks. Qualcomm says the IPQ8074 is a highly-integrated all-in-one platform designed for access points, gateways and routers. The 14nm chip integrates an 11ax radio, MAC and baseband, and a quad-core 64-bit A53 CPU as well as a dual-core network accelerator. It uses a 12x12 Wi-Fi configuration (8x8 on the 5GHz band and 4x4 on the 2.4GHz band) and supports MU-MIMO for uplink. As a result, it can deliver up to 4.8 Gbps while maintaining fast connections over a larger coverage area than any 802.11ac chip. The chip also features Qualcomm's Wi-Fi Self-Organizing Network (SON) which simplifies installation and optimizes traffic. On the client side, Qualcomm says the QCA6290 SoC can offer up to a 4x increase in throughput speed in a crowded network. It supports 2x2 MU-MIMO and can realize the full benefits of the 8x8 MU-MIMO thanks to its 8x8 sounding mechanism. The chip can combine 2.4GHz and 5GHz bands using its Dual Band Simultaneous (DBS) feature to deliver up to 1.8 Gbps Wi-Fi speed. Compared with 802.11ac, the chip can reduce power consumption by two thirds. Qualcomm says it expects to sample both of these chips in the first part of 2017. That means there's a chance consumer 802.11ax devices will be available later this year. Any new Wi-Fi standard will improve battery life, since the range is typically further and data is transmitted faster so the client does not need to work as hard. However, ax has a new feature called wake time scheduling. This enables APs to tell clients when to go to sleep and provides a schedule of when to wake. These are very short periods of time, but being able to sleep a bunch of short times will make a big difference on battery life. I’ve talked with chip, AP and client device manufacturers about when to expect 802.11ax products, and we should see the first consumer Wi-Fi routers in the early part of 2018 with an outside shot of late 2017. After that, the business grade APs and clients will follow. We are certainly close enough that network managers should be starting the educational process and planning now. If you’re not sure what this means for your business, talk to your Wi-Fi vendor, as all the major wireless LAN suppliers are planning to support 802.11ax. One final point: If you need to upgrade now, I certainly wouldn’t put if off and wait for ax. Wi-Fi is extremely important to businesses of all sizes and will become more important as the Internet of Things (IoT) becomes more widely adopted. The evolution of client devices has been “game changing,” as there’s almost nothing we do that doesn’t involve them. The 802.11ax specification finally brings a Wi-Fi standard to the network that can support all of the things we want to do with our wireless LANs.